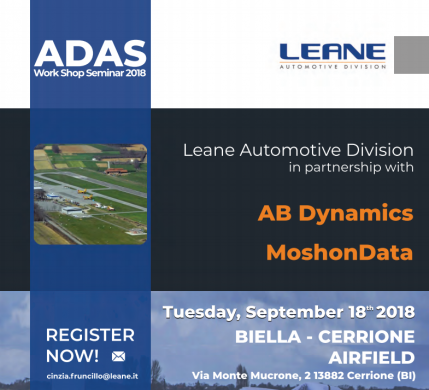 AB Dynamics supported its Italian representative Leane Automotive Division at the seminar which included demonstrations of its test equipment in action, performing typical ADAS scenarios. AB Dynamics’ steering and pedal robots were displayed along with our drive-by-wire vehicle directly controlled using the Flex-0 controller. This vehicle can be used for path following and Synchro without installing driving robots, simplifying test processes and reducing costs. Also on display was AB Dynamics’ TrackFi Pro wireless telemetry system used for 100% reliable data transfer to the base station. It uses military-grade hardware and is powered by a unique meshing protocol which operates across the network giving low-latency, high-resilience communication with any other unit in the system, even with no direct connection, ensuring dependable communications coverage. You can also find out about our wide range of solutions for vehicle development including the SPMM 5000 and aVDS.